Scrambling – the hazy middle ground between hill walking and rock climbing – is great fun, and our brand-new series of video tutorials on BMC TV will help you to strike the right balance between speed and safety. The BMC Insurance website now has a sleek new look; you'll also find it slick and quick when you buy insurance for your next trip. Join us later this month for a walk in the Peak District, a buffet lunch, and a presentation of our proposals on how we can improve our work for hill walkers. Ticked off the easy classics and want to take your scrambling skills up a notch? Supported by DMM and the Association of Mountaineering Instructors, our new video series aims to give you the knowledge you need. The BMC is inviting members to a forum in Hayfield, Peak District, to hear about our latest ideas to improve our work for hill walkers. The last youth competitions of the season are almost here and with some changes to the 2016 calendar, there will be some slight changes to these last two competitions of the season as well. Farewell long summer days. Hello crisp mornings and cold evenings, sticky slopers and solid crimps. At last, bouldering season is here. But whilst you crush project after project, remember that the rock is your friend, not your enemy. With the seasons changing now is the prime time to plan your winter adventures. To help you explore the mountains this winter we asked our experts James Thacker and Neil Johnson (British Mountain Guides) to give us the lowdown on six winter ridges that will reward you with a grand day out. What’s better than a day in the hills? Easy – several days or more. Here are our top six essential tips for walkers looking to take their first steps into walking far and sleeping wild. Does your club want to attract new members? The answer could lie in joining the growing number of clubs offering indoor to outdoor meets for novice climbers. Britain’s mountains may not be the highest or most spectacular, but they do sit in the path of the prevailing Atlantic weather systems. This can result in some seriously hostile weather! So, when venturing into the hills and mountains you should take suitable protective clothing for the conditions, which may change dramatically over the course of the day. Don't let Christmas shopping stop you making the most of the winter: save time and money with these offers from the BMC shop! Have you been impressed by the BMC’s campaigning work? If so, cast your vote in the annual awards run by The Great Outdoors magazine. Voting closes on Monday 10 November, so don’t delay. 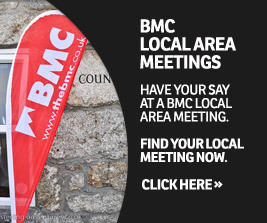 We hope you find the BMC monthly email newsletter useful.